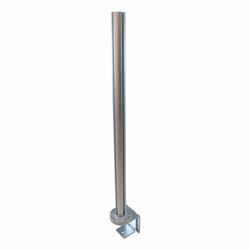 Position your LCD monitor at any height along this 23 1/2" aluminum post for maximum viewing comfort and efficiency. Most LCD monitors simply pivot vertically a few degrees on their stand. Using this desk mount pole system gives you much greater flexibility. The monitor mount (sold separately) pivots vertically through a range of 35 degrees and horizontally 160 degrees. The keyboard arm with reversible mouse pad (also sold separately) gets the rest of your system up off your desk. This system is great for presentations and other situations where you stand in front of your computer.